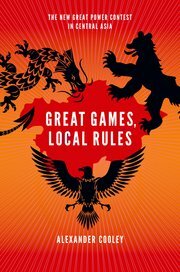 Alex Cooley has positioned himself as a leading expert on the “new great game” in Central Asia and so it is fitting that his newest book Great Games, Local Rules (GGLR) has itself become an often-cited treatment on the topic. GGLR offers a broad perspective of competing and complementary interests that intersect in Central Asia, while simultaneously providing depth of analysis on the ground. This balance is acknowledged in the title–the great games played at the supranational level are constrained by local realities. At the strategic level, the United States is motivated by stabilizing Afghanistan. For the People’s Republic of China, restive Xinjiang holds sway over Beijing’s calculus in the region. Russia seeks to remain a privileged player in Central Asia; what Cooley describes as “Moscow’s quest for renewed regional primacy” (6). The games between these three are marked, not by zero-sum competition, but by tactical cooperation, emulation of transnational institutions, and reorientation of policies both foreign and domestic. 1. “Regime survival is state security”: Since 9/11, Central Asian elites used counterterrorism efforts to strengthen internal security capacities. Central Asian regimes have married internal and external security issues so that internal reformers, such as democracy promotion and human rights monitoring, are cast in a threatening light. After the Color Revolutions, such reforms became “regime change” and Western values lost ground in favor of “sovereign democracy” (a Russian idea). 2. “State resources and private economic gain”: Central Asian elites use state resources as private resources. Rulers and their families benefit, depending on the country’s resources, collude with eager international investors. 3. “Elites as brokers and gatekeepers”: This practice is a carryover from the Soviet-era patrimonial political system. Central Asian regimes maintain legitimacy by keeping the money flowing to political clients. Thus local elites strike side deals with external players of the game. During the 1990s, Central Asian regimes kept patrimonial politics quiet as they touted desires for democratization and reform to attract international donors. By the 2000s, with the three players stepping onto the field, Central Asian regimes felt emboldened to consolidate power and practice patrimonialism in the daylight, knowing that punishment not be forthcoming as long as local elites had something to offer these three. Cooley dedicates one chapter to each of the big three (e.g., U.S., Russia, China), describing their objectives and strategies, as well as the obstacles. Each chapter contains a good dose of history and concrete examples that support his broader arguments. Using the chapter on the U.S. as an example, Cooley focuses on base politics, autonomy of CENTCOM commanders, and the New Silk Road strategy. Cooley’s Base Politics provides a more systematic treatment of the topic, while his treatment in GGLR is limited to Uzbekistan’s K2 and Kyrgyzstan’s Manas bases. Cooley describes the realignment of Uzbekistan’s security posture away from close U.S. ties after the 2005 Andijan incident and fears of U.S. support for regime change due to the Color Revolutions. The eviction from K2 played to Kyrgyzstan’s benefit with the increased value of Manas. CENTCOM commanders lubricate transactions with untraced discretionary spending that end up supporting patrimonialism, while the need for the Northern Distribution Network placed U.S. officials in a tough negotiating position when constructing the New Silk Road. U.S. policymakers learned to play by local rules–criticism of domestic policies declined in favor of obtaining security objectives. Central Asian elites took advantage of U.S. backpedalling after policymakers realized that too strict of a human rights line could lead to severe retaliation. Cooley’s treatment of Russia and China focus on their respective regional institutions and the issue of energy markets. For Russia, its regional institution of choice is its Collective Security Treaty Organization (CSTO), its economic partner, the Eurasian Economic Community (EurAsEC), and the accompanying Customs Union. These organizations are avenues for Russia to “reassert its regional primacy” (72). Moscow’s attempt to monopolize the gas market in Central Asia also reflects this objective. Beijing’s regional institution of choice is the Shanghai Cooperation Organization (SCO). Cooley explains how the SCO has become a standard bearer of China in Central Asia, meaning that its reputation is intricately tied to the reputation of China. Many initiatives that are in reality bilateral agreements are trumpeted as SCO successes. China’s multifaceted strategy in Central Asia encompass its security agenda in regards to Xinjiang instability, securing energy supplies via the Kazakhstan oil pipeline and Central Asia-China gas pipeline, and promoting multilateralism and non-intervention as an international norm. In addition to individual treatment of the “big three,” Cooley includes a more “functional” approach to the region in examining the democratization/human rights and antiterrorism nexus, Kyrgyzstan’s base bidding war, and the corruption involving foreign oil companies and fuel deals. This approach solidifies the trends already noted about local elites using the great game to maximize private benefits. Counting the points, Cooley declares China as the current winner of the great games. Naturally, these great games will repeat and as the U.S. repositions with its withdrawal from Afghanistan in the post-2014 era, a new constellation may emerge. But so far, Beijing has successfully made headway on all its objectives. While Cooley declares China the current winner, Beijing’s future policy remains the wildcard. Of the three, China’s policy is arguably the most opaque. Not only are official position papers less readily available, Cooley rightly notes the contradiction between the SCO’s non-intervention agenda and Beijing’s desire to see regional integration. Cooley ends GGLR with a call for U.S. policymakers to learn from its last decade of engagement with Central Asian states. The decline of the “liberal order” detailed in GGLR is best summarized in the title of Joshua Kurlantzick’s latest book, Democracy in Retreat, which investigates the same situation from a global perspective. This decline, Cooley suggests, will occur region by region, much like it has occurred in Central Asia. The remedy? U.S. diplomats must be flexible in dealing with regional partners and take advantage of the varying actors in each region. Western policymakers must engage and challenge new norms being pushed by Russia and China. Washington must consider the cost of compromising on the Western value regime currently enshrined in the reigning international order; a value regime that is not just a burden, but also a boon to the United States’s global image. GGLR comes at a transitional period in the region. Looming large over geostrategic calculations is 2014, which will mark a significant reduction of the U.S. footprint in Central Asia. The conversation about the so-called “new great game” will continue in Washington think tanks, Foggy Bottom, the Pentagon, and other foreign policy influencers. Perhaps Cooley’s most important contribution to said conversation is the persistent demand that we take “local rules” into account. The rules of this game are not set solely by great power interactions, but rather Central Asian elites have bent the rules to their advantage. A second contribution, which has been reflected in prior policy papers, is that this new great game is not zero-sum. Counting points is thus not an easy task. The three major players all cooperate at times and compete at times. To demonstrate this, one need only point to the dramatic roller coaster from Russian support of a (temporary) U.S. presence in Central Asia to launch Operation Enduring Freedom, to a deterioration of U.S.-Russian relations, to the “reset policy” in order to get the NDN off the ground, to another deterioration of relations. GGLR deserves the attention analysts are giving to it. The National Bureau of Asian Research dedicated its July 2013 issue of Asia Policy to a roundtable discussion of the book. Students of Central Asia should add GGLR to their reading lists.